I found some free time one Saturday and after a point became so restless not knowing what to do. It started as clearing some stuff in my room when I came across my art kit. 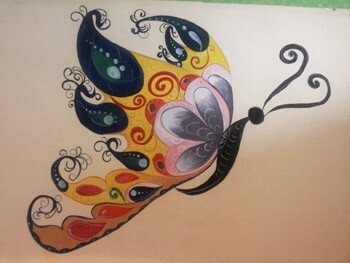 So I decided I would paint a wall mural - a rather big butterfly. It got done very late but it left me highly satisfied. A friend of mine saw the picture and said, "The picture depicts ur soul.. gentle, shy, free, bold,.... so many qualities of both extremes.... Beautiful". This is what it made me realize: we all do things that express who we truly are inside. This was my inspiration to write this so as to benefit a larger audience. We all have busy lives, running our own races and tackling various commitments. We are playing multiple roles and try our best to do justice in every mask we wear. Despite all this, we mostly find time now and then with nothing pressing in on us. If you think you don't, I suggest you start taking some time out for yourself. There is a high possibility that what we do in that time defines what we are inside. That is the one time when we do not have to wear masks, please others or worry about anything. So, think again. What do you do that makes you happy? What is it that makes you feel alive? Makes you feel yourself? Yet again, the answers vary and for good reason. For some it could be reading your favorite author, writing, or just chewing the cud of what you have come across. Sleeping is another way of utilizing the alone time although it is increasingly labeled unpopular. My mother is a gynecologist and she hardly finds time for me and my brother. But I have always noticed her finding happiness in cleaning the house and putting things in order whenever she finds some time for herself. This is because she enjoys it and she is a person who reflects orderliness and cleanliness. The more outdoorsy types usually explore activities such as trekking, cycling hiking, rappelling or rock climbing. These reflect that you like to test your own limits and in the process understand yourself better. Some others are into sports, learning a new language, dancing or painting. In fact, I have a friend who likes to try new things every time. Sometimes he bikes, treks, photographs, reads, gyms, gossips or sleeps! That is who he is, a person open to experimenting and experiencing new things. We need to understand that unconsciously we are reflecting our creativity, strength and comfort levels. A movie line goes, "A man is defined by the alcohol he prefers". I believe that in addition to alcohol, one is defined by what he does willfully. It is our comfort zone which will define whether we take the beaten path or we create our own. But the road you take, as Frost says, will make all the difference. I am not justifying those activities that push the limits of our existence, or considered 'cool' are to be chosen. What matters is if you can positively answer these simple yet difficult questions. 1.Is this who I really am? 2.Is this what I want truly? 3.Am I happy doing this? Sleeping, eating or gossiping maybe conventionally classified as mundane activities, but they are perfectly fine if that is what you enjoy. It is never bad to catch up on lost sleep or with get updates from old friends. However, for those of you who have answered "NO" to even one of the above questions, I urge you to rethink where your interests lie. I agree that it extremely difficult for us to identify ourselves without those masks. It has become a way of life and we are highly used to them. Try to find out who you really are, discover your interests and nurture them. Flaunt them and love them. Trust me; it will bring a lot of change in your lives. It is actually fun to live without a mask and to do what we yearn for. Careers are a whole other realm. Most of us get into jobs by default and before we realize if we like our profession, it is generally too late for such thoughts. However, this is something you can change right now and it will not affect anybody negatively. Make some time for yourself at least once or twice a month and do what you like. If anything, it will bring you happi-ness and improve your efficiency in the other roles you play. Paul Laurence Dunbar has captured the essence of what I have attempted at saying in his poem, "We wear the mask". Devote some time to understanding yourself. Churn your soul and decide on what you will be if you never had to wear a mask. This is something we all owe to ourselves. Rediscover yourself and live that way as and when possible! Any facts, figures or references stated here are made by the author & don't reflect the endorsement of iU at all times unless otherwise drafted by official staff at iU. This article was first published here on October 2013.